Corduroy fabric began as the English gentleman’s country attire. It had a similar feel as velvet, but was traditionally made of cotton or cotton blends instead of the silk that went into velvet. It’s a durable, long-lasting fabric, rich with history, that’s still useful today. When you’re looking for a fresh piece in your wardrobe that still feels and looks traditional, try a custom corduroy jacket or trousers. We will ensure that they fit as comfortably as your custom suits, and you can enjoy them on occasions that don’t call for a suit. Corduroy is a great option for cooler weather and your seasonal wardrobe. Most corduroys are made in tan colors, but don’t overlook the fresh look of gray or a rich chocolate brown corduroy. Scarlet, green, or plum corduroys can make beautiful accent pieces. Typically choose fabrics with closer-set wales (ridges) for jackets and farther-set wales for trousers. Corduroy sport coats pair well with dark jeans, giving you a classic option for more casual occasions. Patch pockets and single vents work best in casual sport coats, while welt pockets and side vents will create a dressier look. When you’re customizing your own wardrobe items, you have the ability to incorporate whatever design features showcase your own signature style. 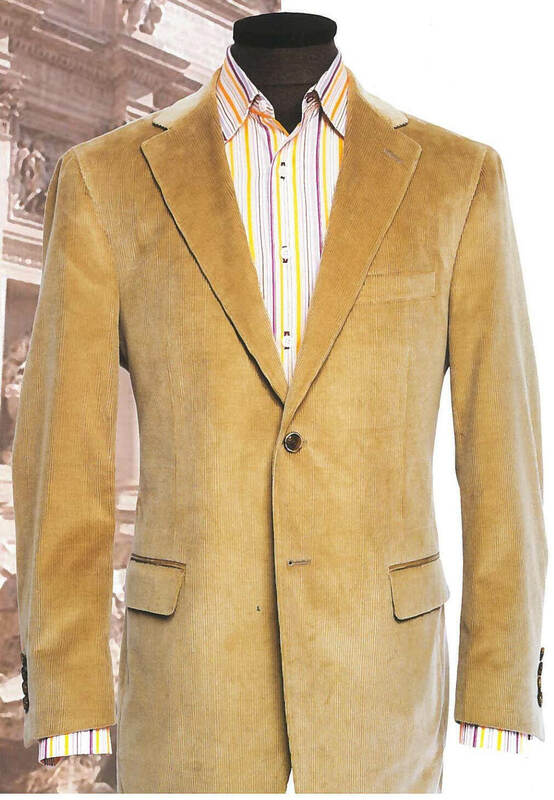 Corduroy expands your clothing options and adds timeless appeal to sport coats and trousers. The cooling weather of autumn is accompanied by an explosion of rich colors as designers turn to some of nature’s most spectacular hues. Expect to see a splash of orange this fall, from pumpkin to autumn maple leaf colors. Designers are also dabbling in deep reds, such as plum and scarlet. Many clothing lines will emphasize low-contrast stripes and checks that create subtle visual interest, along with weaves that incorporate micro designs such as squares, diamonds, and diagonals. Several clothing designers are designing fall pieces using fabrics woven from yarns of different thicknesses, which results in a rich textural sensation. Diagonal weaves will be prominent this fall, which also create an appealing texture. Let’s chat about incorporating your favorite fall colors into your custom wardrobe. Call today for your exclusive appointment.